This disease is caused by viruses.The disease is also called Little leaf/Mosaic/Wrinkled-leaf/Sickle-leaf disease in different regions. The disease causes mosaic pattern with light and dark green areas, mainly on the younger leaves. Subsequently produced leaves are small, crinkled, brittle, and leathery with chlorotic patches/streaks. The affected vines will become unproductive. The affected vines exhibit shortening of internodes to varying degrees. The leaves become small and narrow with varying degrees of deformation and appear leathery,puckered and crinkled. Chlorotic spots and streaks also appear on the leaves occasionally. The yield of the affected vines decreases gradually. Mainly noticed in parts of Kannur, Kasaragod, Kozhikode,Wayanad and Idukki Districts of Kerala and Kodagu, Hassan and Uthara Kannada districts of Karnataka. Two viruses namely Cucumber Mosaic Virus (CMV) and Pepper Yellow Mottle Mosaic Virus (PYMV), a Badnavirus are associated with the disease. The major mode of spread of the virus is through sap, cuttings, grafting, cutting knives and implements; and also through insect vectors like aphids (Aphis gossypii) in a non-persistent manner. 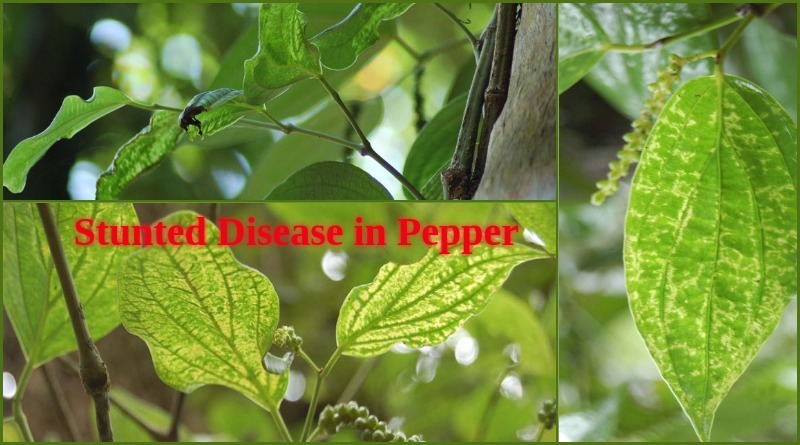 The virus can also survive in cucumber, chillies, tobacco, cowpea, green gram, black gram etc.The disease can also be transmitted through insects like aphids and mealy bugs. The viruses may even take 2-5 years to express the typical symptoms depending on varieties, age of vine, nature of virus strains, climatic conditions,vector associated. The following strategies are recommended for the management of the disease. Use virus free healthy planting material. Infected vines should not be used as mother vines and source of planting materials. Regular monitoring to remove and burn the infected plants. Insect vectors such as aphids and mealy bugs on the plant or standards should be controlled with insecticide spray such as dimethoate @ 0.05%. Improve drainage, adopt weed control and proper spacing, remove excess suckers. Oil based formulations of Copper oxychloride @ 0.2- 0.4% (2-4g/L) is also very effective.